Apologies for not having posted as regularly as I used to. I find I'm spreading work between my school computer and my work computer and don't seem to think about uploading things as much. Also, as my current unit of inquiry is very specific to the local area, I don't really see the point in posting the resources as I can't imagine most of them will be of use to any of you! Anyway, here's a nice little freebie to tide you over for a while. 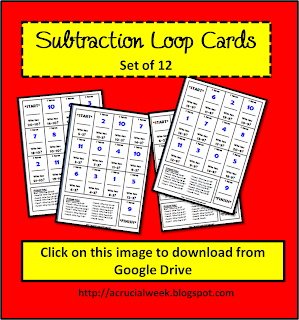 It's a subtraction loop game similar to the addition one I posted previously. I have a "How Fast Can You Go?" chart on the wall to accompany it. I blu-tack an A4 page to it each week to record their best times. It's been 12 weeks and the children love it. In fact, they get quite upset if we don't get around to this on a given day! Just click here or on the image below to download from Google Drive.